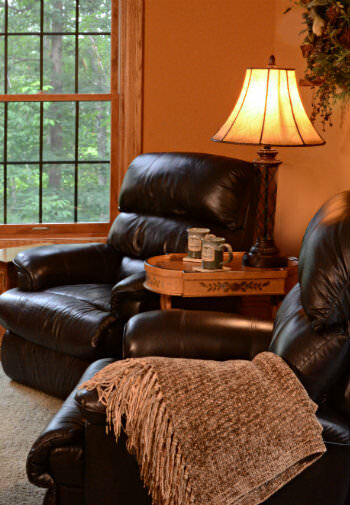 This two-room suite at Woodland Trails Bed and Breakfast features a large living room with two reclining chairs, a love seat and a reading chair positioned to look out at the pond and Gazebo area. The large TV is connected to Direct TV and a DVD player. A free standing Ben Franklin-style electric fireplace adds quiet ambience. A sliding door makes for a private entrance and leads to a small deck with stairs leading to the side yard and pond. 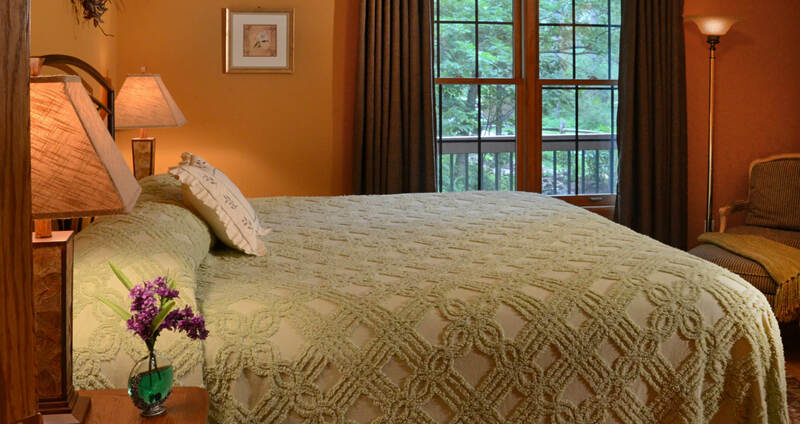 The bedroom has a king-size bed, Pergo wood flooring and generous windows with a view of the wooded side yard. The private bath has a small whirlpool tub and a separate shower room. Refreshments are available at any time from the refrigerator stocked with complimentary bottled water, soft drinks and wine, plus a Keurig Coffee Maker. See how the Owners’ Suite compares to the other B&B rooms.